Nasima Begum, Secretary, Ministry of Women & Children Affairs has visited YPSA’s anti-trafficking project Ashshash: for men and women who have escaped trafficking, on 12th December, 2016 at Chittagong. 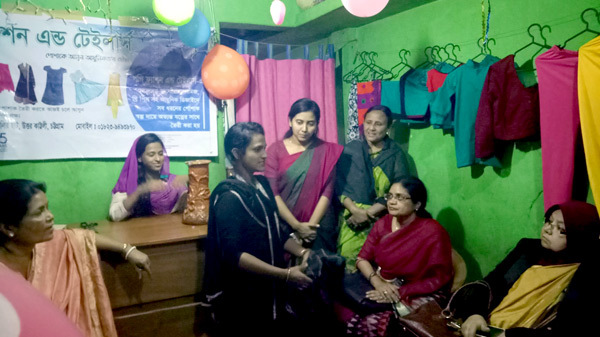 Firstly she visited Popy Fashion & Tailors (A shop owned by the Rakiba Akter Popy who is one of the beneficiaries of YPSA-Ashshash Project) at Kalirhat, near City gate, Chittagong. Here she discussed about her previous case story, vocational training, current situation and her future plan. Then she met another beneficiary Bibi Kulsum (proprietor of Kulsum Fashion & Tailors) at Kornel hat, CDA 1 No Road, Chittagong. Here she talked with Bibi Kulsuma in the same manner. IOM and YPSA team has presented details activities, challenges and future plan of YPSA-Ashshash project. Mr. Md. Aynul Kabir, Joint Secretary, Ministry of Women & Children Affairs; Mrs. Sharmin Akter, Executive Magistrate of DC office; Mrs, Anjana Bhattacharjee; District Women and Child Officer; Mr. Md. Arifur Rahman, Chief Executive of YPSA; Mrs. Asma Khatun, National Program Officer of IOM; Syed Assraf Ullah, Program Manager of YPSA; Mrs. Farah Amina Khatoon and Md. Ibrahim, Project Officer of YPSA-Ashhash Project were present during the visit. YPSA (Young power in social Action) is implementing a pilot project on human trafficking named ASHSHASH (for men and women who have escaped trafficking) at Chittagong & Cox’s Bazar district. The project is funded by SDC (Swiss Development Corporation) & supported by IOM (International Organization for Migration). The project goal is to ensure the mainstreaming of 30 escaped trafficking survivors into their society with safe work and dignified Life. Ashshash is a very unique project to reintegrate trafficking victims in the mainstream society. In the consequences of the project activities, Ashshash project is giving business maintenance support for its beneficiaries. At Chittagong & Cox’s Bazar, already 23 beneficiaries have got in-a-kinds support from this project. By running those small enterprises, beneficiaries will develop their self-esteem as well as their earning for livelihood- that is the key essence of Ashshash project.